Since the devastating grasshopper does not have a picky palate, some may assume that it’s able to thrive in a wide variety of environments. This, however, is not the case, because there are more issues than simply the availability of food when discussing where an organism will thrive. Melanoplus devastator is extremely sensitive to changes in climate (Tatar et al. 1997). The particular climate range is what keeps this species of grasshopper in its native homeland of the Californian portions of the west coast. Since the climate and conditions are hospitable for the grasshopper, it is also here that the grasshopper does the most damage. Through various studies, scientists have come to realize how profound the effects of elevation are on the rate of aging in the Melanoplus devastator. Grasshoppers that are found in areas of low elevation have been noted to have longer lifespans compared to those who live in regions of higher elevation (Tatar et al. 1997). Elevation affected, not only was the lifespan, but also the average body size of grasshoppers. Therefore, the grasshoppers in high elevation that had shorter lifespans also displayed smaller body size; the lower elevation grasshoppers that lived longer were also larger in size (Tatar et al. 1997). This relationship, however does not indicate direct causation that all small devastating grasshoppers are from regions of high elevation and are destined to die early, it does, however, suggest correlation between the two factors. There is a clear relationship between the genetics of grasshoppers and the environmental factors that they face (Tatar et al. 1997). The unique relationship between the grasshopper and its environment also leads to another interesting piece of information about this devastating little insect. It isn’t confined with mating with grasshoppers within the Melanoplus devastator species, in fact, it has been known to mate and hybridize with Melanoplus sanguinipes (Orr et al. 1993). These two species are considered to be distinct from one another but that doesn’t completely prevent them from forming offspring with one another. Throughout the Sierra Nevada area of California there are hybrid zones in which these two species of grasshoppers have commonly been known to mate and produce offspring (Orr et al. 1993). Sometimes when organisms from different species mate and attempt to reproduce, their offspring die at a young age or are infertile. However, in the case of the Melanoplus devastator and the Melanoplus sanguinipes their offspring are viable (Orr et al. 1993). 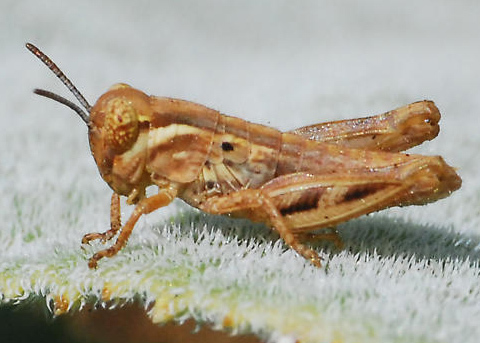 Though not every condition is favorable for the devastating grasshopper, it still finds ways to do immeasurable amounts of damage to gardens and crops in the California area. Because it can also interbreed with the Melanoplus sanguinipes, the grasshopper’s habitat range can spread into the hybrid zones as well (Orr et al. 1993). Because the grasshopper can eat nearly any plant that is in its environment, it isn’t a particularly to get rid of. In general, if grasshoppers are a problem, b order plowing is among the most effective ways to stop the eggs from hatching and the grasshoppers from damaging crops (Bentley and Philips 1992). Insecticides can be effective when battling nymphs and adult devastating grasshoppers (Bentley and Philips 1992). If you or someone you know is fighting to rid their garden, crop, or vineyard from these pests, remind them to read directions and labels carefully before using the product. Don’t let your hard work be devastated by the Melanoplus devastator or the Melanoplus sanguinipes, but please also consider the effects insecticides will potentially have on the environment.